An individual kouign aman, a breakfast pastry from the Viennoiserie group that is as addictive in its own way as a great coffee cake. Photo by Corey Lugg | THE NIBBLE. CAPSULE REPORT: Seldom found in French bakeries in America, Kouign Aman is a Breton pastry (from Brittany, a region in France). This laminated pastry is time consuming to make, but the payoff is something distinctive and wonderful. If you’re a baker, make some for Mother’s Day. Or splurge and have them sent from a top baker as a gift. This is Page 1 of a two-page article. Click on the black links below to visit Page 2. As lovers of laminated pastry know, it is rich and buttery comfort food. 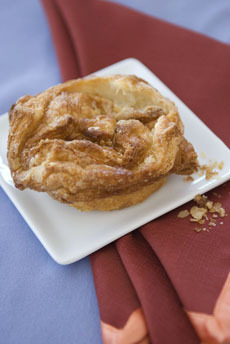 Kouign aman adds caramel and the crispness of the pastry top to the mix. It’s irresistible, although according to one local, it’s not enjoyed daily as Americans might enjoy their doughnut or cheese danish, but reserved for special occasions. Laminated pastry is a time-consuming technique of layering and folding a yeast dough—the croissant, danish and other Viennoiserie,* and 72-layer biscuits are examples. It produces many buttery layers that can be pulled apart to reveal thin leaves within. You can see the striations, or layers, of pastry when you look at the top of the Viennoiserie or when you cut into them, and you can pull apart the layers of the baked dough. 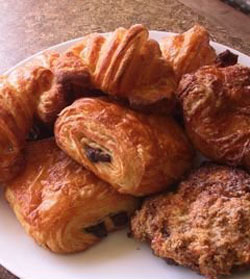 *Viennoiserie refers to all breads and pastries made with laminated dough. This technique is used to make the flaky “breakfast pastries”—croissants, danish, brioche, pain au chocolat and lesser-known specialties like kouign aman. It is a marriage between traditional bread baking and sweet pastry baking. According to legend (subsequently disproved), the croissant was created to commemorate the defeat of the Turks in Vienna; hence, the group of specialty breads became known as Viennoiserie. See our Bread Glossary for the accurate history. To make the dough, called the détrempe (from the French verb, “to soak,” as the dry ingredients soak in liquid), milk, dry yeast, brown sugar, bread flour, and sea salt or kosher salt are kneaded together. Some recipes use starter dough from a prior batch. Dough is chilled, then rolled out into a rectangle. A smaller rectangle of rolled out dough and chilled butter, called the beurrage (from the French word for butter, beurre), is placed on top of it. Then the construction of the pâton, or dough roll, begins. The rectangle is folded into thirds, as if folding a letter (in fact, this first fold is known as a “single letter fold”). The pâton is then refrigerated for an hour, then rolled and folded again. The rolling and folding continues, usually for four turns. It is an expensive (because of the amount of butter needed) as well as a time-consuming process. Photo: You can see the difference in the fluffy, flaky, buttery dough of the Viennoiserie, above (croissants at top, pain au chocolat in the center and the kouign aman at the far right top) and the non-Viennoiserie flat scone at the bottom right. Photo © copyright Les Madeleines. †Caramel is made by heating sugar. Caramel candy is made by boiling sugar with butter and milk; vanilla or other flavorings are used, and glucose or corn syrup is added to prevent crystallization.